Bangkok Day 1 photo album here. Courtesy of Cebu Pacific’s “Every Juan Can Fly” promo, aboard flight number 5J 931, I first saw Bangkok last May 10 roughly at half past 1 in the morning (plus one hour for Philippine time). A post-rain breeze soaked the city. Besides, it was late in the evening and the athmosphere was quite bed friendly. 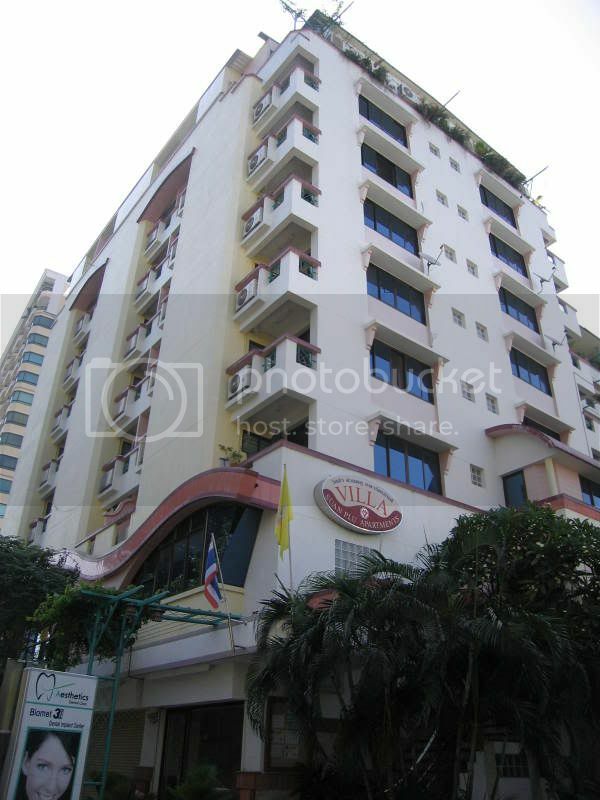 Nothing fancy, I just went to the “metered taxi” queue and asked the dispatcher to make a note about my destination (Villa Suan Plu in Suan Plu/Sathorn area where my friend Evelyn is renting a condo unit). “Suan Plu”, by the way, is pronounced as “Swan Phu”. I always had a struggle with the taxi driver everytime I had to go back after a nightcap. The thing with the Bangkok airport taxi, there’s a surcharge of 50 baht plus the meter plus the toll fee worth 65 baht (this is standard so don’t be surprised when asked about the fee). To reach Suan Plu, I paid around 400 baht plus tip for having an honest taxi driver (given that I was at first ignorant with the denomination, he returned the change after the two toll gates and he made it a point that I was gatecrashing the correct condo). I reached Villa Suan Plu still clueless if I was in the right place. 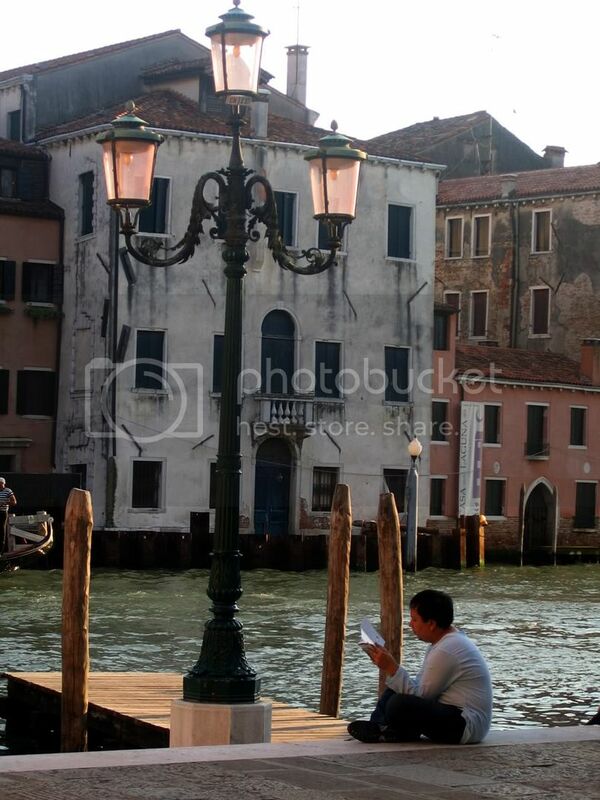 The place was quiet and an attendant who came from nowhere made a conversation in Thai. Since the taxi driver was still around, he spoke on my behalf with a piece of paper containing my friend’s contact details. I rang Evelyn and asked the attendant to allow me to proceed to her room. My friend Evelyn happened to be an officemate at Equitable Bank. We spent an hour or two more for chithat and “tsismisan”. Since I was excited on what’s in store for me on my first day, I woke up with only two hours of sleep. I did the usual morning ritual. Evelyn’s place is a studio type with one master bed (I slept on the floor), a toilet, and a veranda for drying clothes, a sink and a makeshift dining area. We shared some Gardenia pandesal and cup noodles (my “baon”). For Day 1, Evelyn joined me in her group of officemates with another visitor from Brazil. They settled for Thaksin Central Pier as a meeting place. To reach that from Suan Plu Soi 8 (phet in Thai), we took a song theow, which is equivalent to our jeepney only with better space for “sabit”. A ride costs 6 baht and you have to pay only after alighting. 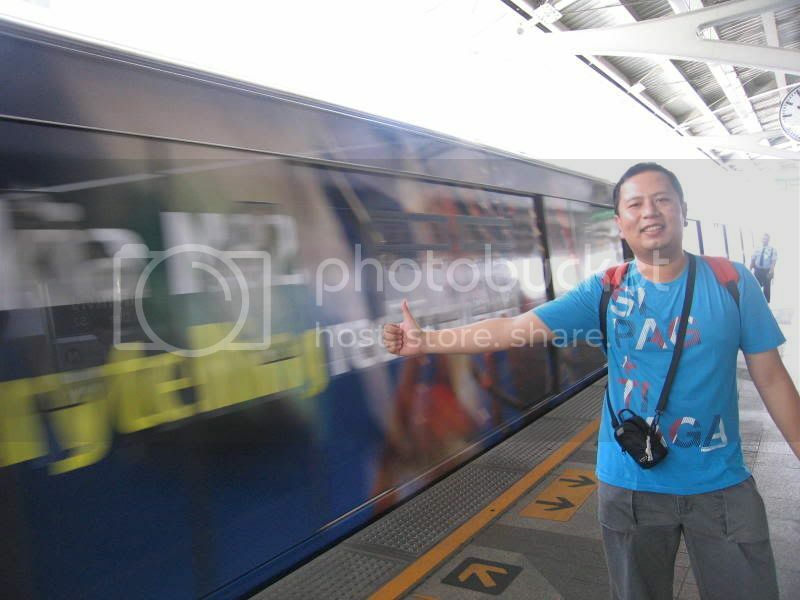 Then we took a sky train (BTS) from Sala Daeng (pronounced as “sala deng”) to the pier. There I met Hong and Joyce, Evelyn’s officemates, and Jefferson, their Brazilian visitor. As Pinoys as we are, we arrived 30 minutes late. From the pier, we took Chao Phraya Boat Express to Tha Tien (15 baht, price is fixed) then took another boat to get across the river for 3.50 baht. 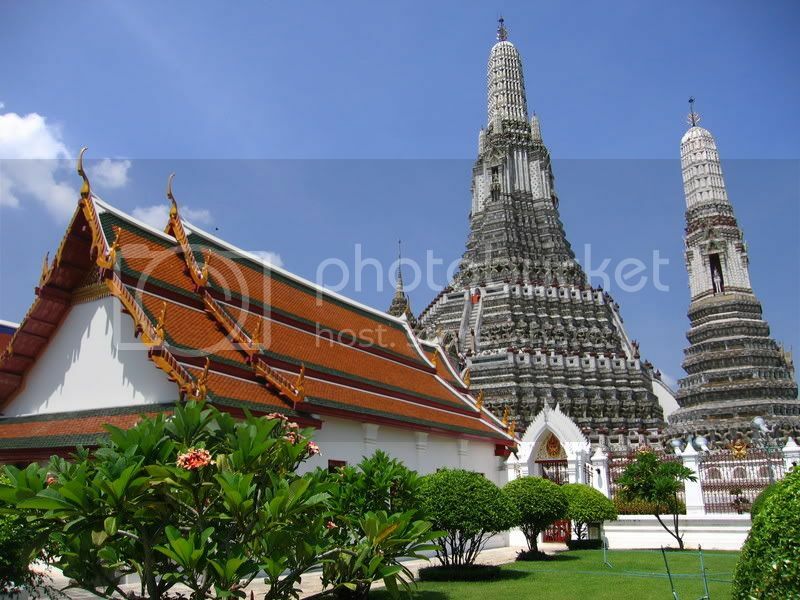 Wat Arun, the Temple of Dawn, was right there waiting for us in the middle of a sunny Saturday. The temple has Khmer style, as my book said. I got a free entrance because I don’t look like a “farang” (foreigner). Aside from the porcelain-made giant temple (I climbed it for 20 minutes), there’s nothing much in the area so we got back to Tha Tien station. I bought a bottle of water and a stick of grilled longganisa (well it tasted like one but I’m not sure if it really was a longganisa). Wat Pho (entrance is 75 baht) was just a few steps away from Tha Tien. Not another temple, I would say. 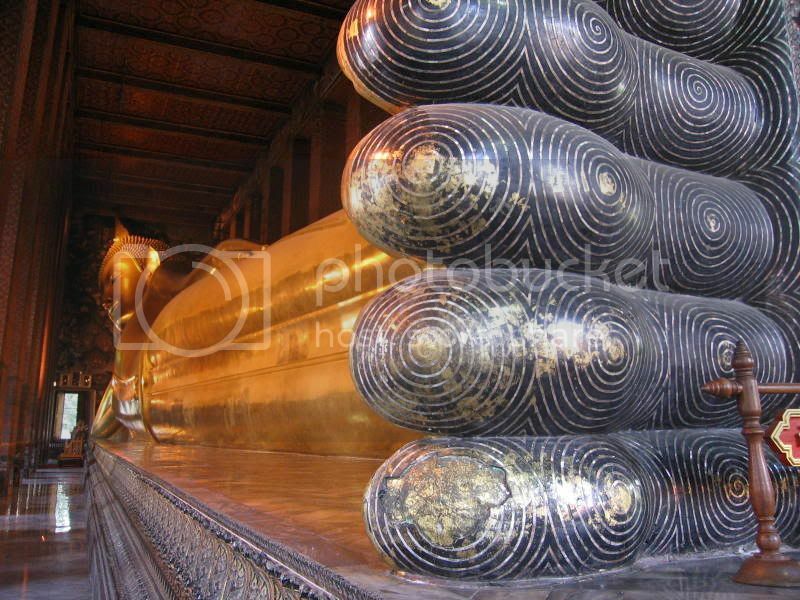 The famous reclining Buddha is having a rest there. It was so huge that it occupied almost the whole temple. I now wonder how “The Beach” captured the icon in its entirety. Around the area are some chedis (pointed dome could be the nearest description). After this, hunger knocked in and we had lunch at a nearby carinderia (there are lots of it in Bangkok). I had fried rice and a not so spicy tom yum (how silly to have one). Jefferson didn’t eat any, I didn’t know why. 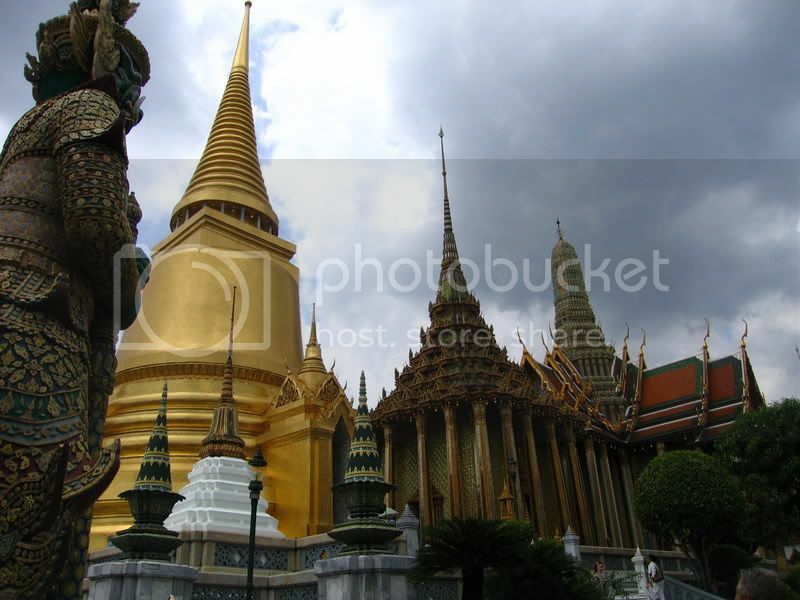 From there, we took a cab to Wat Phra Kaeo (the home of the emerald Buddha) and the Grand Palace (which was so grand). To visit the area, you need to pay up for 250 baht. 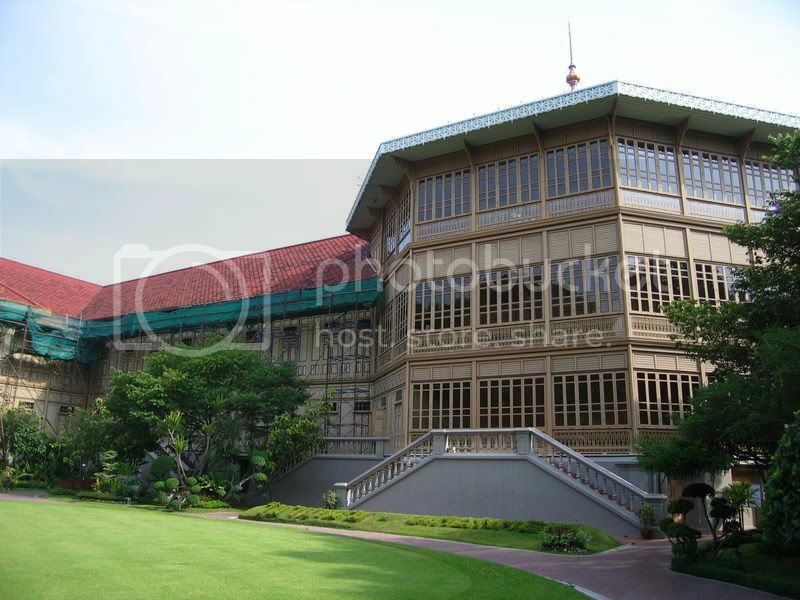 A bit expensive but that includes an entrance to Wimanmek Mansion (the largest teak mansion in the world), a favorite. This was the point when we felt the long hours of walk and water wasn’t helping. It was really hot that day. Well, on our way to Wimanmek, a giant komodo dragon sprung up from a nearby manmade canal with a catfish on its mouth. Adrenalin rush! After Wimanmek, our group caught a cab and Evelyn and I were dropped to a mall (which I forgot the name). Going to the entrance, there was a crowd cheering for a celebrity product endorser. I just took a picture and didn’t bother asking who the hell was the “artista”. Inside the mall, I had the chance to convert my USDs to baht and bought some “pasalubong” that included spicy squid, champoy, durian chips (that taste like cashew) and more. I also got a muay thai shirt and a shot glass for my (and dad’s) collection. From there, we stopped by at Pantip which is also known as the IT Mall. It boasts for what it seemed like an endless stalls for anything techie. My boardmate requested for a Kingston 4gig thumb drive which I got for only 500 baht. After 30 minutes, Evelyn and I were already in a bus to Suan Lum Night Market. We spent another hour or two for haggling and shopping. Then we had a dinner of pad thai, chicken with mushroom and kangkong. It was a coupon foodcourt, meaning, you have to buy some coupons first then use it to buy food and drinks. You may claim the unused coupons until a designated deadline. 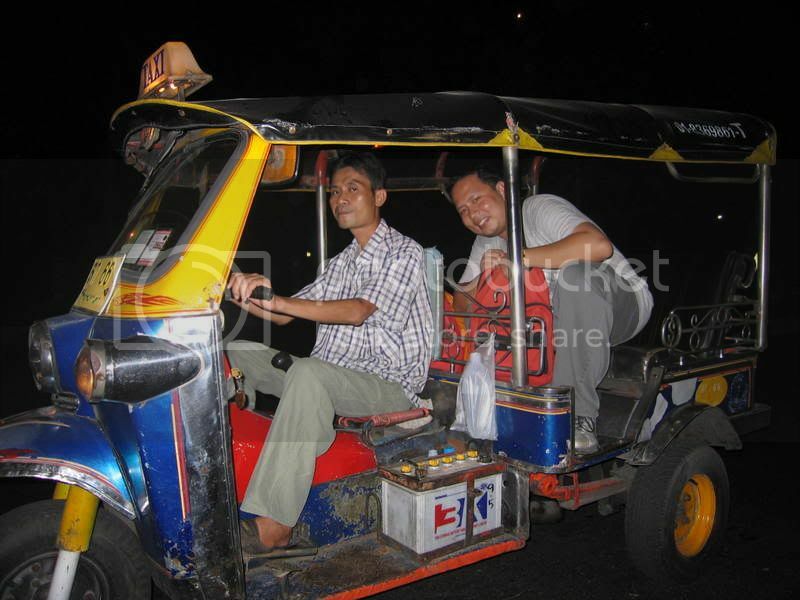 We capped the night with a nice tuktuk ride back to Suan Plu. To Travel the world is a blessing!